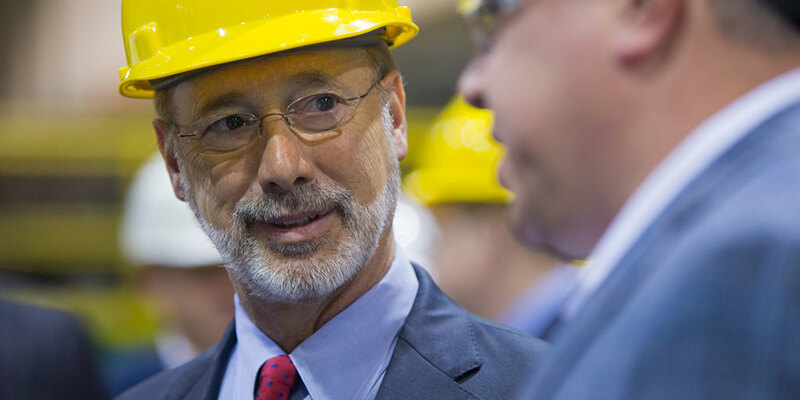 Harrisburg, PA – Governor Tom Wolf announced today that the state will invest nearly $6.3 million through the Pennsylvania Industrial Development Authority (PIDA) program to help spur statewide business development in five counties. The investment will create 184 new, full-time jobs and enable businesses to retain another 610 current employees. Through May 2017, PIDA has approved $20.7 million in low-interest loans that have resulted in $31.5 million in private investment and supported 522 new and retained full-time jobs. Over the last month, PIDA approved over $6.2 million in six low-interest loans for five projects in Allegheny, Bedford, Cameron, Clinton, and Huntingdon counties that will generate an additional $108.5 million in private investment. The Regional Industrial Development Corporation of Southwestern Pennsylvania was awarded a $2 million, 15-year loan at 4 percent on behalf of Doughboy Square Partnership L.P., for the construction of a 24,792-square-foot addition to a building in Pittsburgh, Allegheny County. The building is being utilized as a single-tenant facility. This project will allow for the property to be converted into a multi-occupancy building. The Bedford County Development Association was awarded a $65,000, 15-year loan at 3 percent for the first seven years on behalf of Heritage Cove Inc. to assist with the construction of an 8,700-square-foot boat storage facility. Funds also will be used to pave 30 existing camp sites on the company’s 99-acre waterfront resort in Liberty Township. North Central Pennsylvania Regional Planning and Development Commission was awarded a $1,250,000, 10-year loan at 3 percent on behalf of Embassy Powdered Metals Inc. for the acquisition of equipment owned by American Sintered Technologies Inc. (AST). This loan is part of a project with the Governor’s Action Team through which Embassy will retain 48 full-time employees, while also retaining the additional 48 employees previously of AST. The Clinton County Economic Partnership was approved for two loans, both on behalf of First Quality Tissue, LLC. The first loan was a $2,250,000, 15-year loan at 3 percent for the first seven years for the construction of an 850,000-square-foot manufacturing facility at the company’s current production complex located in the City of Lock Haven. In addition, a $400,000, 10-year loan was approved at 4 percent for machinery and equipment to be utilized in the new facility. These loans are part of a project with the Governor’s Action Team that will allow the company to retain 508 full-time employees and add an additional 184 full-time positions. Huntingdon County Business and Industry Inc. was awarded a $302,000, 15-year loan at 4 percent, on behalf of Struck Properties LLC. Funds will be used for the acquisition and renovation of a 140,000-square-foot multi-occupancy building located on 14 acres in Smithfield Township. Qualified applicants are eligible to select either a reset rate of 3 percent for the first seven years or a fixed rate of 4 percent for real estate financing, a 4-percent fixed rate for equipment loans, 4-percent fixed-rate loans for a 12-month period for working capital and accounts receivable lines of credit, and a 2-percent fixed rate for pollution prevention and energy efficient loans. Rates will be in effect for loan applications received through June 30, 2017.